Nick Loomis, of CM Skullies, models one of the hats he will pitch on "Project Pitch It." 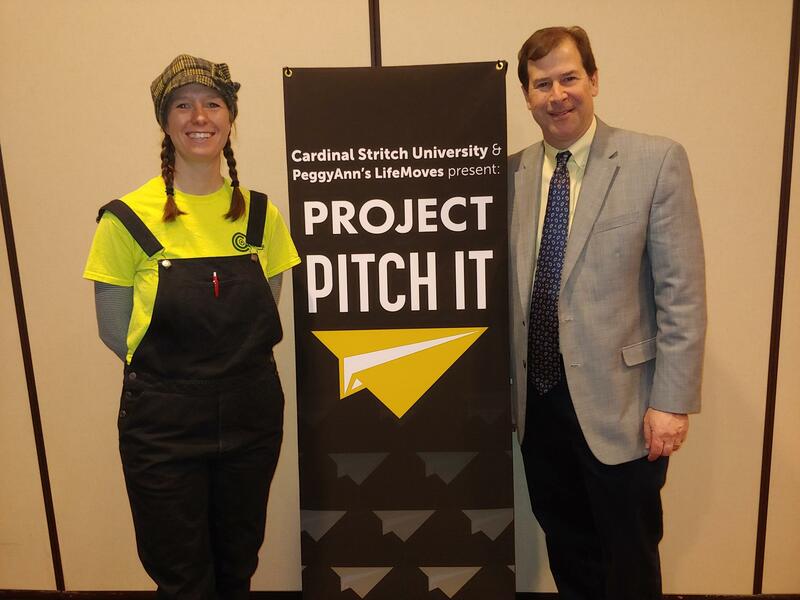 Chuck Quirmbach reports on Wisconsin entrepreneurs going on television for "Project Pitch It." Some entrepreneurs say the Milwaukee area can be a good, but not great, place to start a business. One challenge is simply getting the word out about new products or services. So, some people have turned to appearing on a local television program called "Project Pitch It," which begins its third season Saturday night. On national television, ABC's “Shark Tank” show has entrepreneurs compete for the financial backing of tycoons - called "sharks" on the show - and a bidding war can erupt. Bev Greenberg is the show's creator and Co-Executive Producer. She says the program that airs on a number of TV stations throughout the state has made it to a third year partly by inspiring would-be entrepreneurs. “We all want to say to ourselves, 'I can do that,' and then inspire people to get off the couch and then do it," Greenberg explains. This year's contestants include a retired, disabled Iraq War veteran from Racine, Nick Loomis. He and his wife Abrianna created the company CM Skullies, which offers beanies and headbands that have small openings for eyeglass frames to slide in. Nick Loomis says his main market of motorcycle riders almost always need eye protection, and based on his own riding, the head covering often doesn't stay on right. "After I was injured overseas, I had a perforated left eardrum, and I would lose equilibrium. So I had to cover my ears up, and everything I tried before wants to rise up off my head and my ears,” explains Loomis. So, the veteran says he and his wife went to work designing headgear that would keep glasses in place. Loomis says like many entrepreneurs, he could use more capital, but his biggest challenge is to find the right manufacturer as sales increase. "We're trying to get it into America. We had to step overseas because that was the best place we could find it. It turned out okay, but it could have been better. So, we are still searching for the right fit, for us," he says. Appearing on “Project Pitch It” won't guarantee Loomis success. But the show which chooses its competitors from a pool of applicants, says the vast majority of the entrepreneurs from the first two seasons are still in business. Season One contestant Melissa Tashjian of Compost Crusaders says her company is slowly growing. The company picks up food scraps from businesses, schools and residences and delivers them to a compost facility in Caledonia. Compost Crusaders now has three full-time employees and four part-timers. Tashjian says a challenge is changing what's thrown in the trash. "What we're really trying to do is create an eco-industry in Milwaukee around organics diversion. So that takes a lot of infrastructure, it takes a lot of different players," she explains. TrueMan McGee, owner of Funky Fresh Spring Rolls and a Season Two contestant on the television show, says he faces a different issue. Even now with twelve employees, production is a challenge. "Being able to keep up with demand for the product, which is a good problem. But it also could be a problem if we aren't able to keep up with demand," McGee says. 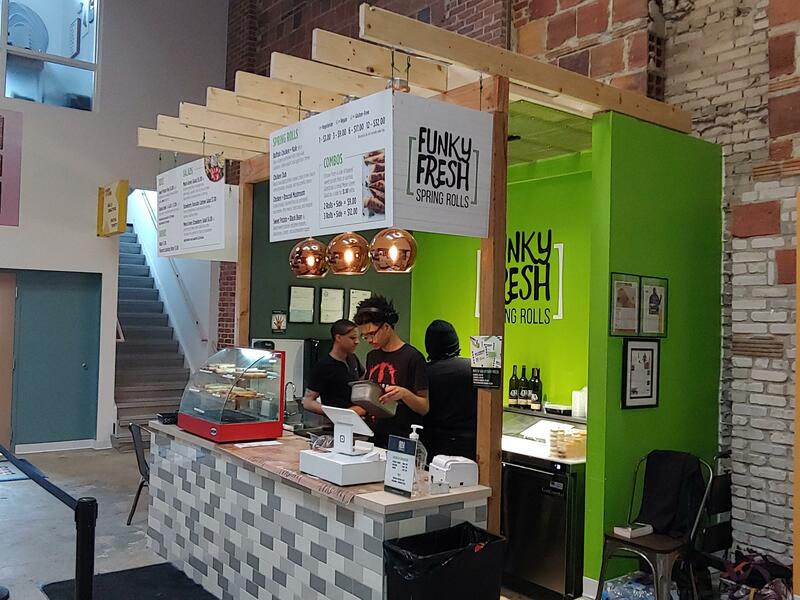 The Funky Fresh Spring Rolls kiosk at the Sherman Phoenix development, 3536 W. Fond du Lac Ave.
Mark Gesner runs Cardinal Stritch's innovation hub. He says he's heard the many concerns about lack of money, access to expertise and production headaches. But Gesner notes the good news for entrepreneurs is that Milwaukee's cautious ways may be changing. “The ground is becoming much more fertile in Wisconsin. We are seeing more accelerators, incubators, investors take note, and also large corporations take note of the importance of developing innovation, of developing talent," he says. The show airs Saturday nights in Milwaukee on WISN -TV.